Family owned and operated, Arctic Air has been serving Quinton, Alabama, and the surrounding areas since 1991. We specialize in heating, air conditioning, ventilation, and refrigeration for commercial and residential clients. 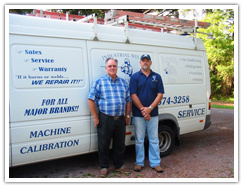 Our knowledgeable technicians are dedicated to customer satisfaction. Our dedication to our work is what makes us able to provide quality, professional services in a timely manner. For affordable service you can depend on, contact Arctic Air today! Copyright © 2011 CGI Communications Inc. All Rights Reserved.